The Hilo (ITO) International Airport on the Big Island of Hawaii was previously known as General Lyman Field before 1989. The airport lies on the eastern shore of Hawaii about two miles east of the city of Hilo. 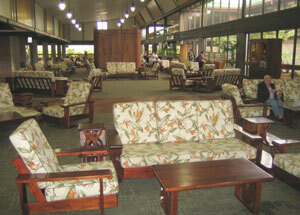 After deplaning you will enter the passenger terminal near the southern end of the Hilo airport. Next, head to the baggage claim area and locate your bags. After retrieving your baggage you can simply exit the passenger terminal and cross the access road (Kekuanaoa Ave.) and go to the rental car business you booked with. 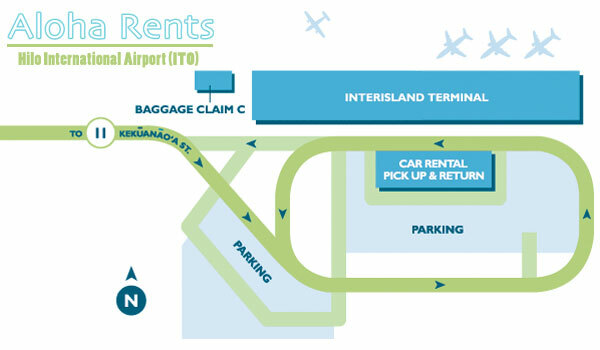 Fill out a few items on the rental agreement and you will be directed to your vehicle, which is located behind the rental car booths. We recommend renting a Jeep in Hilo, but any vehicle will do. Book your Big Island rental car through us and save money. Visit our Hawaii rates page or get a rental car reservation now.